If you have some sort of problem with your vision, whether it be short sight, long sight or astigmatism, you will need to wear lenses to be able to see well. These lenses can either be set into frames to wear in front of your eyes – the traditional glasses – or they can actually sit on the front of your eye – contact lenses. Choosing which one is the ideal for you depends on several different factors. Advantage: glasses take only a second or two to put on and can be taken off just as easily. This sounds very obvious but if you have quite bad eyesight and you can't see without any glasses or lenses, you will probably need to have one pair of glasses for first thing in a morning. You may then want to put in contact lenses but you need to see your way to the bathroom to find them... More seriously, the convenience of glasses is one of their major plus points. They can be cleaned easily and are always ready when you need them. Disadvantage: glasses are affected by changes in temperature. If it's cold outside and you go into a warm house or office, the lenses in the glasses 'steam up' and you either have to wipe them or wait until the fogging clears. Likewise, they are affected by rain and snow. If you work outside or you have a hobby like fell walking or orienteering, glasses may not be the most practical choice. 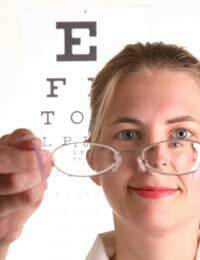 Advantage: glasses do not make your eyes sore and they don't give you an increased risk of eye infections. Disadvantage: glasses can press on the bridge of your nose and behind your ears when worn for long periods and may need adjusting for the perfect fit. Advantage: glasses today are a type of fashion accessory and you can have several pairs for different looks. Designer frames have become very popular and some people prefer the image that wearing glasses gives them. Disadvantage: glasses do change your appearance and if you prefer people to see your whole, natural face, you may find that glasses get in the way. Disadvantage: glasses tend to break if you stand or sit on them. Pro: contact lenses correct your vision very well if you have either long sight or short sight and they do so very unobtrusively. No-one can really tell if you are wearing contact lenses or not. Con: contact lenses have to be cleaned very rigorously to prevent eye infections. This is particularly true of hard contact lenses and gas permeable contact lenses. Regular soaking and cleaning needs to become part of your daily routine. As an alternative, you may be suitable for disposable contact lenses but you need to be prepared for the higher costs involved. Pro: Contact lenses are not affected by weather and temperature. They don't get rain spots, they don't mist up when you come in from outside and they don't get greasy fingerprints either. Walking on a rainy day is much easier in lenses and you may also prefer them if you do some sports. Con: finding a lens that has popped out of your eye can be a nightmare. Locating a tiny, transparent lens on your jumper, in the car or on a carpet, particularly when you then can't see very well is a major disadvantage of contact lenses. Con: getting a fleck of dust or grit behind a contact lens can be quite uncomfortable. You need to become adept at removing a lens and cleaning it when out and about. The problem of dust is worse for hard or gas permeable contact lenses which are suitable for people with astigmatism. Pro: contact lenses can be a fashion accessory too. It's now possible to get prescription or non-prescription contact lenses in different colours so that you can actually change your eye colour. Con: contact lenses can be quite fiddly. They need careful cleaning, or changing each day, and putting them in and out can take a little while to get used to. Con: if you are not very strict about your cleaning routine, wearing contact lenses can mean that you get red and sore eyes from time to time, and are more prone to minor eye infections. ...is always down to personal preference but thinking through your own situation and the plus and minus points of both glasses and contacts can be a helpful exercise.